S-parameter models are important part of system signal and power integrity analysis. Non-homogeneous components such as package, vias and connectors are usually solved by full wave (3D) field solver and the immediate outputs are S-parameters. They may be further processed to convert to broad band models represented with basic spice elements for time domain simulation, or they may be used directly for frequency domain. Regardless, it’s often necessary to be able to inspect these models, extract their performance parameters and do some analysis before such frequency domain or time domain system simulation. SPISPro (SPro for short) is designed with this purpose in mind to enable streamlined S-parameter process and analysis for system engineer’s needs. 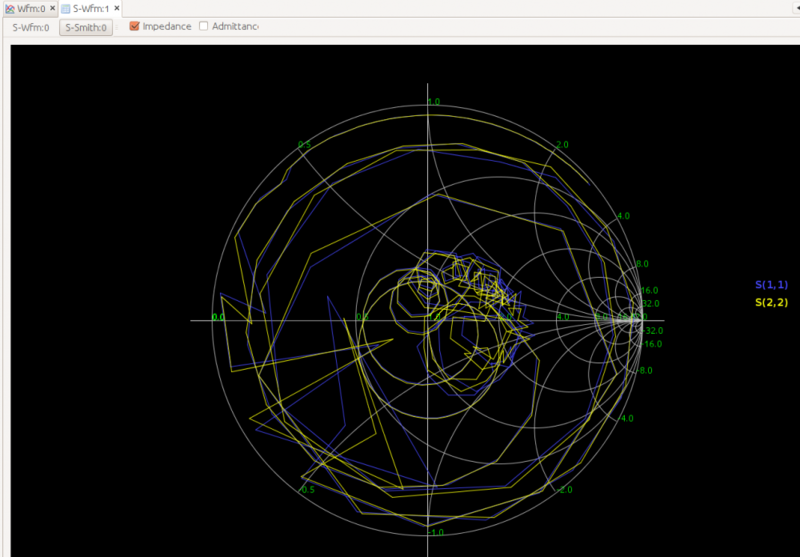 SPro is an add-on of SPIVPro, SPISim’s waveform analysis suite, on top of SPISim’s framework. It delivers cross platform, features rich capabilities in a straightforward and consistent GUI presentation. In addition to S-parameter focused features, the underlying VPro module also provide features such as >30 SI measurements, >20 SI markers and waveform calculators etch which can also be applied to general S-parameter analysis. While SPro does not have 3D field solver, it support analysis of existing models either from simulation or lab measurements. 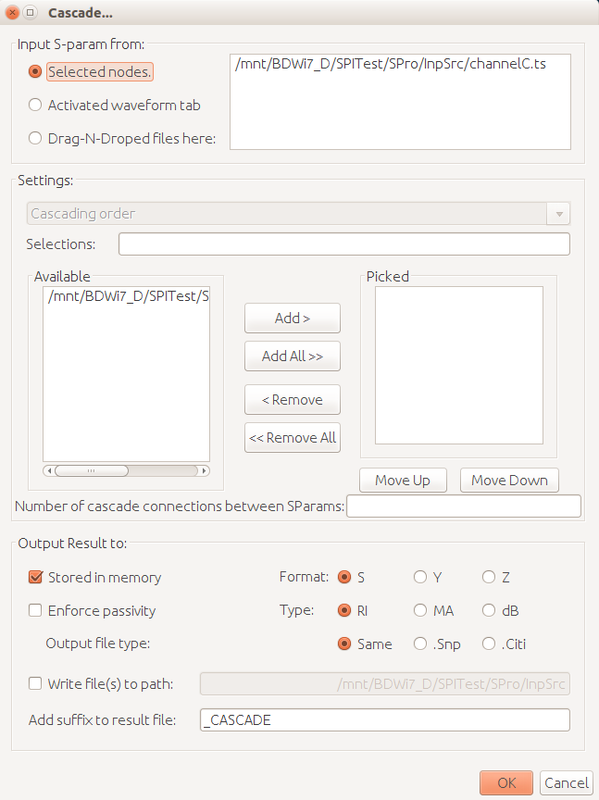 Test benches to extract spice level subckt can be created with SPro to support simulation based S-parameter model extraction. 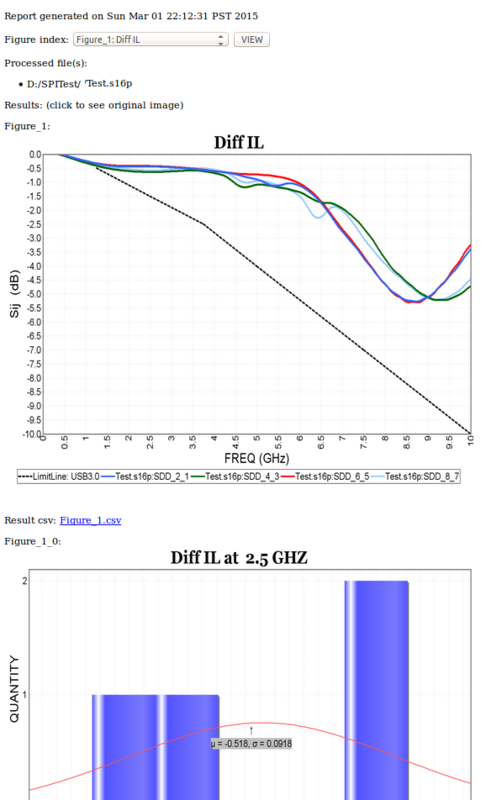 SPro provides ~30 S-parameter comprehensive analysis functions ranging from renormalization to different impedance of each port, mixed-mode conversion to differential or mixed single ended and differential parameters, cascading, extraction, to quality check for passivity etc. Usually engineers need to figure out the algorithm, purchase additional (e.g. RF) toolbox and do programming to achieve the same purpose, now these engineering efforts can be saved to focus on core business logic, SI or PI analysis. These near 30 analysis functions share similar UI interface which provide consistent and easy to learn user’s experience. Generated S-parameters can be view directly or saved into disk in snp, citi or even matlab’s .mat format for further analysis. Often time we acquire multiple S-parameters and need to perform similar processes to each of them and finally generate reports. 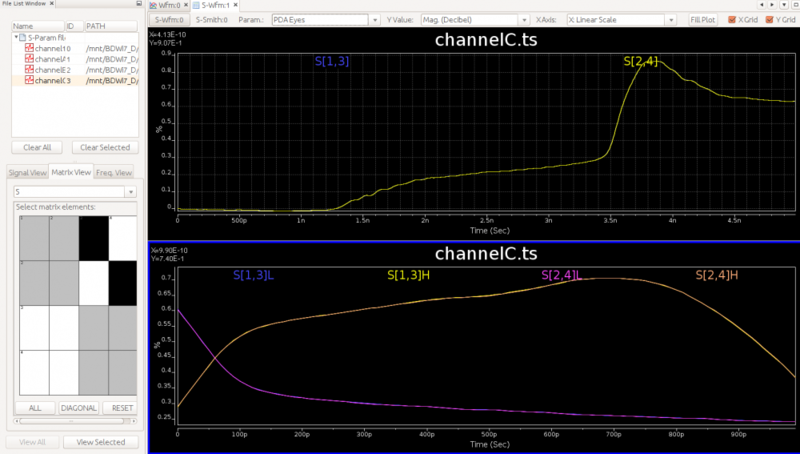 One example is that the s20p needs to be converted to differential mode, renormalize to 45 ohms, do TDR, and calculate skews for each pair and summarized as tables and plots. This normally requires lots of manual steps and is error prune, but not the case with SPro. 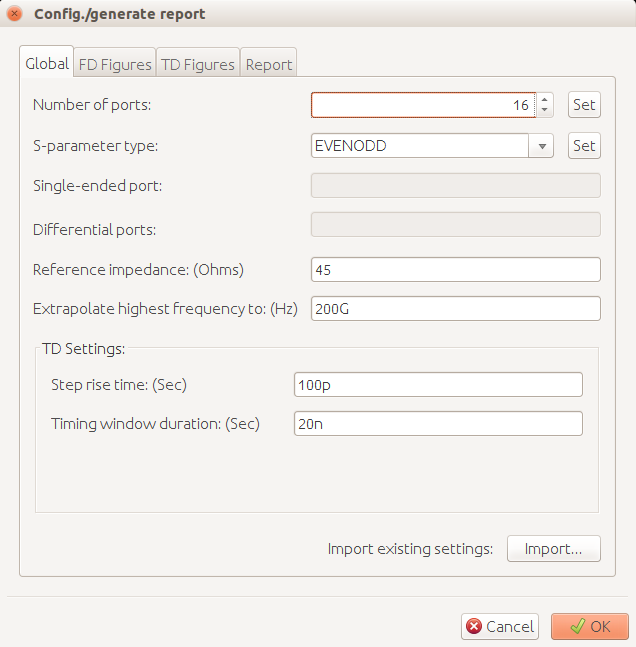 SPro has a reporting feature which allows user to configure process steps to take and FD, TD figures to plot and reports, alone with limit lines. This report settings can be applied repeatedly to one or more S-parameters and results are summarized in html. This can be very useful in lab environment where technicians run the reporting functions to generate data and the engineers can inspect the reports for further debugging. 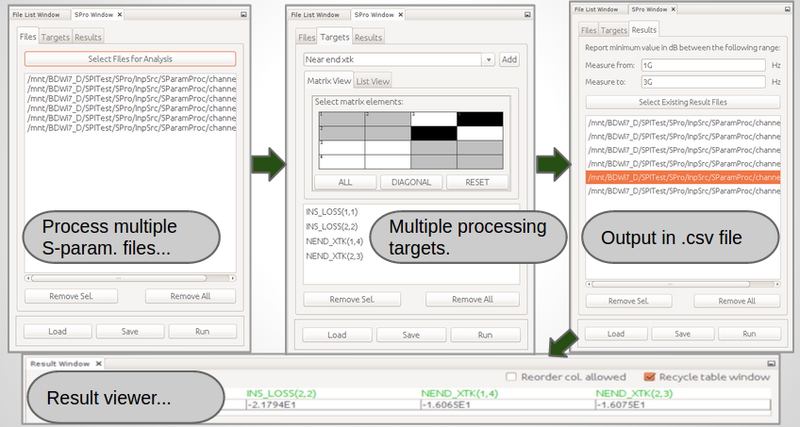 SPro also has batch post-processing features which enable flexible and quick extraction of performance parameters for one or more S-parameters. 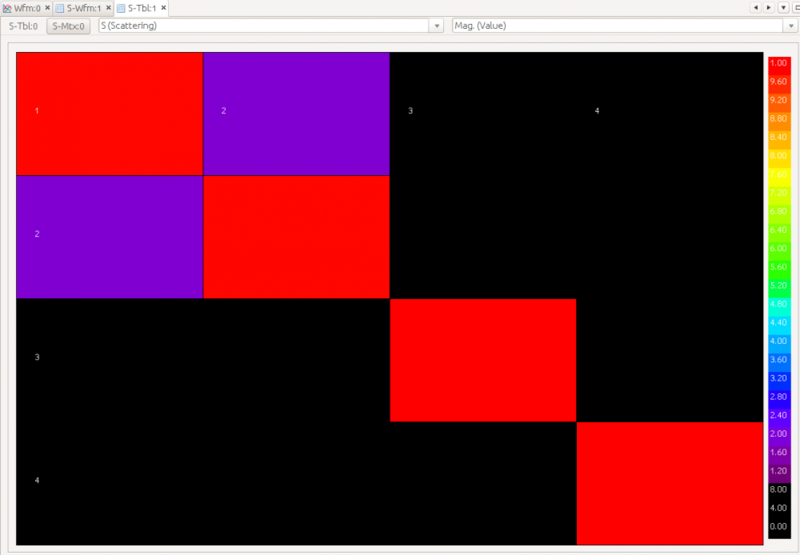 The results are summarized in csv format and can be used for further modeling or optimization. 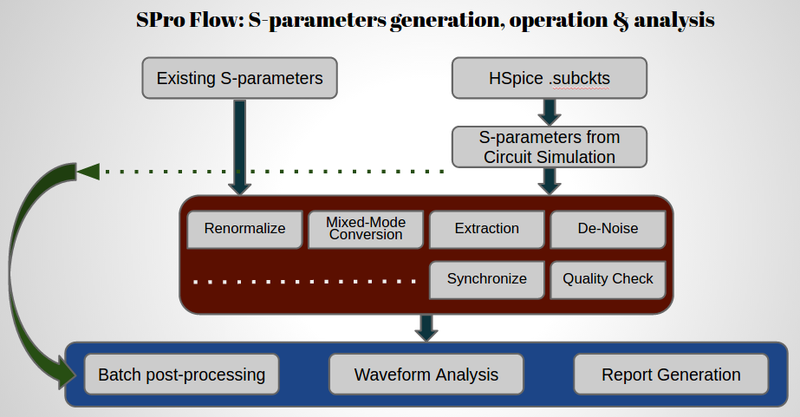 In summary, SPro provides comprehensive and powerful S-parameter analysis capabilities to support signal integrity and power integrity engineers’ design needs.